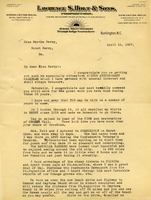 Margaret H. Kruke thanks Martha Berry for the calendar she received. 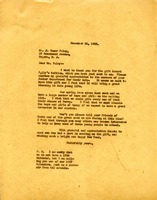 In return, she sends a box of used clothing. She also offers her services as a teacher. 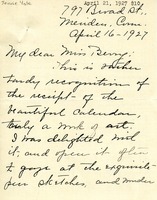 A. F. Taylor thanks Martha Berry for the calendar he received. 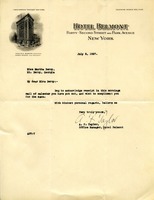 Martha writes to say that she is glad that Irene likes the calendar and encloses a picture of one of the uniforms. Ms. Gales sends $10 to Berry Schools. 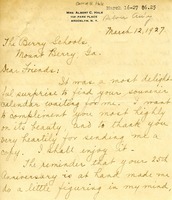 Margaret Lake Foote thanks Martha Berry for the Anniversary calendar and sends a $25.00 donation to the Berry Schools. 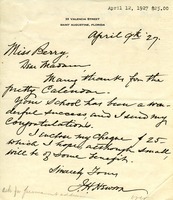 This is a receipt for 10,000 calendars and engravings from the Ben Franklin Press in Atlanta, GA.
Mrs. Hall thanks Martha Berry for the calendar she received and sends a $10.00 donation to the Berry Schools. 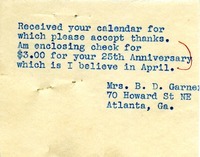 Mrs. Garner sends her thanks and a $3 check for Berry's 25th Anniversary Calendar. 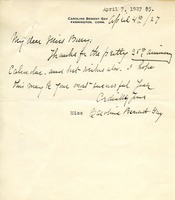 Miss Caroline Bement Gay thanks Martha Berry for the 25th anniversary calendar she received and sends a $5.00 donation in return. 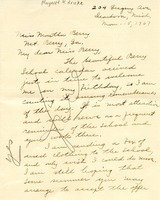 Martha Berry writes to Mr. Foley thanking him for his gift for a student's tuition. She informs him about when their spring term opens and asks him to tell his friends of Berry and the need they have at this time.